Fundraiser "False Alegations of Abuse ARE Abuse!" There is an epidemic sweeping our family court system that really needs to be addressed. Currently in the United States, it is becoming a common practice to circumvent the constitution of the United States by using the family court system as a form of revenge and punishment. In order to gain an upper hand in a custody battle it is becoming a common and acceptable tactic for abusers to manipulate the system by falsely accusing a good parent of child abuse. This is an issue that not many are willing to talk about and because of this the problem is only exacerbated. When a parent is falsely accused of child abuse it begins a cascade of events that there is no turning back from. It is a “process” where the accused is guilty until proven innocent. This is not to say that there are children who are abused and need to be protected but it is time to change the way our court systems work because the current policies are producing modern day witch hunts that are sweeping across the nation. Innocent families are being torn apart and then the children are being placed with the abusing parent or family member. I run a support group for adults who were emotionally, psychologically, and/or physically abused as children. Every single day I hear about these cases. Last year a woman who I will call S.P. joined this group looking for support because she was trying to protect her child H.P. from her abusive grandmother. Two weeks ago, after being physically assaulted by this grandmother S.P. (Mother of the child) decided she needed to set some boundaries and began to limit her contact with her abuser. Last week, grandma called S.P. and asked if she could meet with them because she wanted to give H.P. (child) a hug. S.P. agreed to this meeting and unknowingly walked into a nightmare. When S.P. arrived with H.P. the Grandmother served S.P. with an emergency order of child removal and the child was taken away at that meeting by the grandmother. The history of this grandmother is that she lost custody of her own youngest son who was placed in the care of his Godparents until he was 18 years of age and was allowed to return back to Arizona. The grandmother also has two older children from her first marriage that she abandoned years ago and has never seen them since. It was told to others by the grandmother that the 2 other children had died in a house fire. This grandmother has a history of abuse. It is time to understand that an abuser does not stop abusing because they turn into a grandparent. This child was removed from the mothers care based on false allegations without any due process and a clear violation of the 4th and 14th amendments of the United States Constitution. As a result a modern day witch hunt has been engaged. S.P. now without her own daughter has been accused of being a drug addict, of drugging her own child, and abusing her child. After hearing these allegations, S.P. went to her healthcare provider where she asked for drug testing. The results have come back negative. Slowly, this mother has been proving her innocence and trying to restore her character that was destroyed during her own mother's smear campaign. S.P. has not only lost her little girl under false pretenses but this ordeal has greatly affected her career as well. She has a 17 year background as a 9-11 Dispatcher for Police, Fire, and Medical Emergencies. Currently she is working hard towards her Bachelor Degree in Emergency Management through Kaplan University. On top of that she works a full time job to support her small family. Her attorney has filed a motion for the immediate return of H.P. to her mother’s care but we are asking for the help of others who have experienced this injustice and clear manipulation of our court system. Being caught off guard with a false allegation of abuse leaves the innocent scrambling to find resources to pay attorney fees. The flat fee of the attorney in this case is 1500.00 dollars. In the past week S.P. has sold her possessions trying to come up with the money but she is falling 1000.00 short. We are asking for donations of any amount even if you can only afford to donate 1.00 it will be one small step towards justice. Further, we are creating a call to action to stop the modern day witch hunts taking place in our family court systems. The fourth Amendment of the United States: “The right of the people to be secure in their persons, houses, papers, and effects, against unreasonable searches and seizures, shall not be violated, and no warrants shall issue, but upon probable cause, supported by oath or affirmation, and particularly describing the place to be searched, and the persons or things to be seized.” A clear violation of the fourth Amendment has taken place where there was no investigation or probable cause that S.P. was abusing drugs or her child. We need to urge our court system to take proper steps of due process when denying a citizen of this country the right to their own child based on fabrications of an abuser without an investigation into the allegations. The 14th Amendment of the Constitution States: “It forbids states from denying any person "life, liberty or property, without due process of law" or to "deny to any person within its jurisdiction the equal protection of the laws.” The 14th Amendment was violated as there was no due process of law. This mother was denied the right to her child and we are demanding either the immediate return of the child to her mother or a trial by a jury of S.P.s peers. We are urging the citizens of this country to take action and become involved in this growing epidemic where the laws of the land are clearly being violated under the guise of being in the best interest of the children. We are here to say that it is not in the best interest of the child to err on the side of caution in all cases claiming abuse without investigating those claims. If you are unable to donate to this case then please consider a donation of a stamp, envelope and your time by copying and pasting the following and mailing it to the judge to show your outrage of this legal kidnapping. I am writing today to urge the court to hold Grandparents/ Parents Accountable for False Allegations of Child Abuse. Sometimes hostile people will be vindictive enough to file false allegations of child abuse. With this going on the child suffers emotionally and psychologically because the accuser only filed false allegations to get the upper hand in a custody case. Maybe they just want to get even with the child’s parent, step parent and sometimes other family members. In some cases abuse does occur. But in these cases that many of us have to deal with the accuser will lie in court about child abuse. Sometimes even sexual child abuse. The accuser will not lie only once but many times because they can get away with it. The accused then suffers a violation of their 4th and 14th amendments because there is no due process of the law and the child is removed from the parents care with little or fabricated evidence showing their was child abuse to err on the side of caution. The court system should make these people accountable for their actions. There should be at least a fine to pay, loss of custody, or even possible jail time. Lying about abuse isn't okay its perjury and it's wrong. In fact, false allegations of abuse are abuse. The courts should uphold the law and keep people accountable when they lie about child abuse and lie in court papers. Children shouldn't be used as a pawn to hurt others. 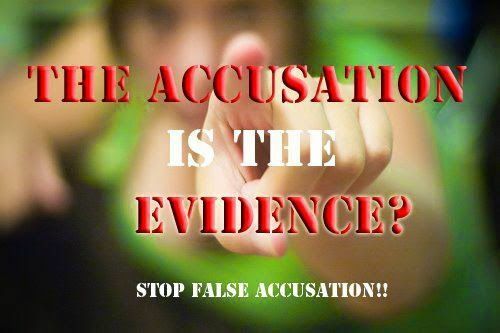 Please keep these false accusers accountable for their actions by sending a clear message that the manipulation of the family court system and the pursuit of a modern day witch hunt will not be tolerated.